The Korean Peninsula is a land divided. On one side you have a very democratic society, enamored with technology, and an emerging business leader on a global scale. On the other side, North Korea. The Democratic People's Republic of Korea, somewhat ironically, is known for being one of the least democratic societies in the world. Never the less these contradictory countries share a common past, despite their present differences. One of these commonalities is the mountains, more specifically the Taebek Mountains. The range spans the Eastern seaboard of the Koreas, and is home to several ski areas including the Alpensia ski resort, on the South Korean side, which will play host to the 2018 Winter Olympics. Perhaps feeling slightly disadvantaged, the North Koreans have also constructed Masik Pass, a slope to call their very own. Masik Pass, or Masikryong, was practically built out of thin air, and only took 10 months to complete with much of the work being done by the North Korean Army. 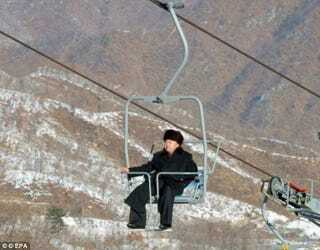 Guests to the resort can enjoy the 700 vertical feet spread out over 9 runs, and the Dear Leader was even thoughtful enough to include a large hotel, complete with bars and shops, for skiers to enjoy. Now who exactly will fill that hotel in a country where only .02% of the population skis, and the majority of whom would probably rather have more food on their plate rather than powder under their feet, is a good question. So if you're planning on making the trip, don't count on meeting too many locals that will give you the true North Korean skiing experience. For those that would like to check out Masik Pass on their own, Koryo Tours offers a guided tour of the are that includes skiing, and checking out the sights and sounds of Pyongyang. For only $330, on top of one of their traditional tours, you can spend an extra day carving down the illustrious slopes of Masikryong.